Lakeview Oasis Cabin is located in Northeast South Dakota on beautiful Waubay Lake, in the heart of northeastern South Dakota’s Glacial lakes. This truly is the beauty and the beast of all properties. 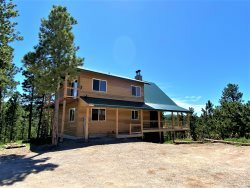 The beautiful 1500 square foot house is encapsulated in a knotty pine interior, a master suite, 60” TV, and beautiful view of the lake. The garage is a true beast and the ultimate man cave. It is 30’ x 47’ and contains in floor heat and is capable of hosting large groups. It houses a bunkhouse with 5 twin beds, a 60” Satellite TV, Grill, wi-fi, and several additional amenities. Entire house including bunkroom has 3 queen beds and 7 twins to sleep up to 13 guests - 10 beds total. Other great fishing lakes nearby include: Pickerel – 5 miles, Enemy Swim – 6 miles, Lynn Lake – 12 miles.